It's hard to believe this 16" square has consumed most of the last year of my life:-) I guess that's the difference doing things entirely by hand. I started working on these last August with the fabrics I used for the BMQG/Quiltcon challenge, That's So Random. 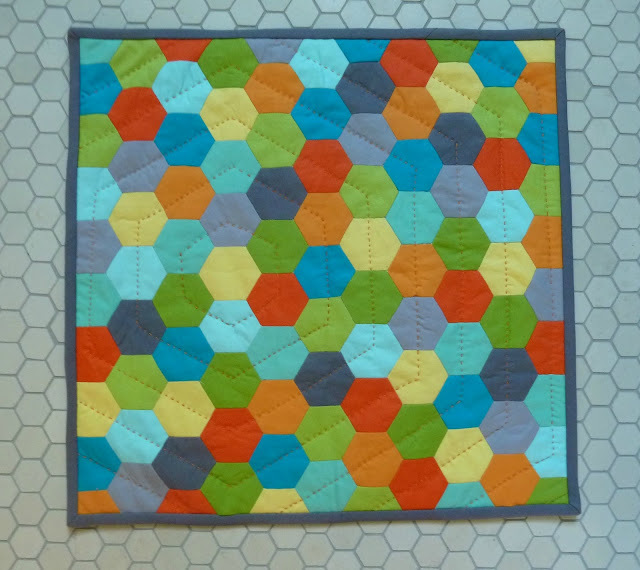 There are tons of great tutorials on how to make hexies but I make mine the way the awesome Jaybird Quilts does it... all 110 of them. The one tip I will share is to use YLI silk thread when you stitch your hexagons together. It's a pain in the a** to work with but your stitches will be invisible! This shot gives you a great sense of the scale. These are all 1" hexagons. 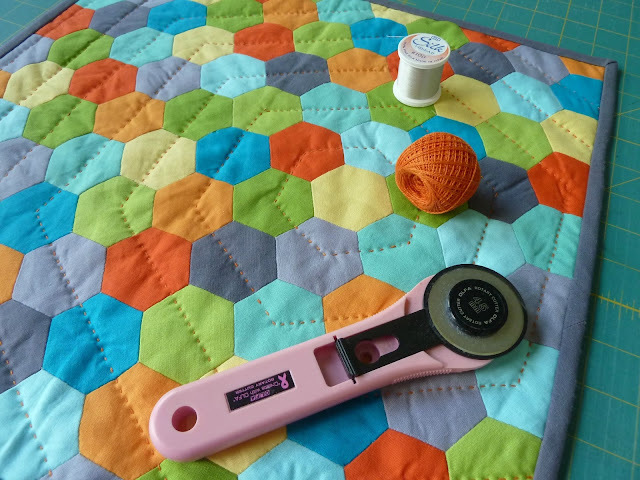 For the quilting I started with an offset hexagon around one of the hexagons and then just echoed that shape out to the edges. For the smaller hexagons I just eyeballed it but as I moved out I got pickier and used masking tape as a guide. I loved working with this orange pearl cotton! Finished quilt is 16" x 16"
Beautiful work!! 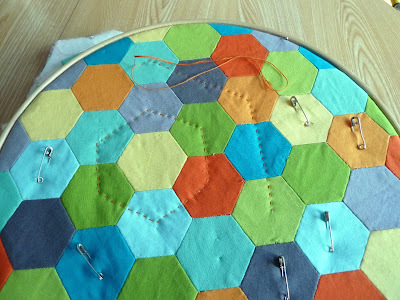 I've hand-pieced hexes and know exactly how much work that is - just gorgeous. Love it and love the quilting. Beautiful! I really love this quilt. I hope it's hanging somewhere special right now. Oh this is lovely! I am always amazed with the beauty of these tiny hexagons. Great job! I love your quilting choice!